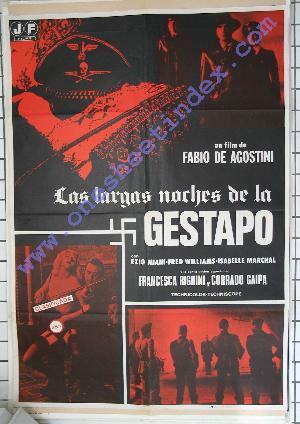 Spanish title: Las largas noches de la Gestapo Original italian title: Lunghe notti della Gestapo (Italy, 1977). International Title: The Red nights of the Gestapo. Directed by Fabio de Agostini with Ezio Miani, Fred Williams, Isabelle Marchall and Francesca Righini. Size: 27x39 inches (70x100 cm) Original poster for the first Spanish release in 1978.